I love guacamole just as much as the next person, but a guacamole smoothie didn’t sound that appetizing for whatever reason. Glad I gave it a blend because it turned out great. 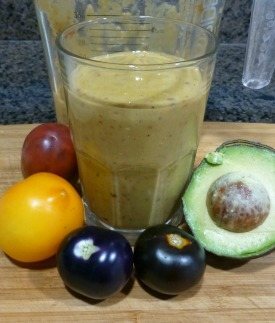 This smoothie gave me an outlet for all my beautiful organic heirloom tomatoes, I could only make so much gauc. This is my first smoothie with tomatoes so I’m going to touch on their health benefits. First, heirloom tomatoes come in many different shapes and sizes and almost always taste better than their conventional counterparts. The better taste is a sign of more nutrition. Heirloom tomatoes are rich in the carotenoid lycopene, which gives the tomato its bright color and plays a role in the prevention of a number of cancers, including prostate, cervical, breast, lung, and skin. They’re also high in vitamins C, great for a number of bodily functions such as supporting your immune system and gobbling up free radicals. The health benefits don’t stop there. Heirloom tomatoes offer cardiovascular protection via their high amounts of potassium and are a good source of vitamin K, required to build strong, healthy bones. The best way to describe this is runny guacamole. Although, you can adjust the consistency pretty easily by using more or less water. It was quite filling, due to the avocado, which is how I like it. Next time I make this I’ll probably add cayenne pepper to spice it up. Enjoy! I’d love to know if you tried this guacamole green smoothie – please leave a comment below. Happy Blending! Delicious! I made this for lunch, as written, adding 1/4 tsp cayenne and a clove of fresh garlic. I was planning to have a spinach salad too, but you aren’t joking when you say this smoothie is filling. I guess that salad will have to wait until dinner. :) Thank you for this creative smoothie idea! It’s great to have someone trying my smoothie creations, and liking them :) You must love guacamole as much as me. I couldn’t believe how filing this smoothie was – maybe I should emphasize that more. Mmmmm. I made this one again today, adding spinach and a little extra tomato, and the garlic and cayenne as I did before. I also used extra water (about 1 cup, including a little ice). It was still nice and thick, definitely still filling, and made for an excellent stand-alone lunch! Very good, Niko. You’re on a healthy smoothie making rampage. Thanks for sharing! I’m on a 30-day juice/smoothie fast and have been craving avocado. Have to try this to quench the urge to cheat. I didn’t have a whole avocado, so I think the amount of water I used was too much. Next time I will follow your measurements. Still yummy though! Thanks! Beautiful! I love the 1/2 cup of deep greens blend. Nice touch. Which avocados do you use in your smoothies? My blender doesn’t have the room for an entire green skinned avocado. Does it matter if in use the smaller Haas avocado? I am having a great time experimenting with your smooth I recipes and discovering what add ons I like best. Thank you for all the great recipes.